I was at a gas station on my way to New Orleans last weekend. So what's up with these DVDs? No-Return DVD Rentals? 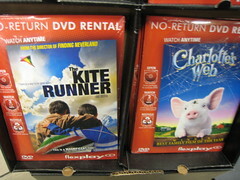 For $4.99, you can rent them and not return them anymore. It was shrink-wrapped. Like regular DVDs, Flexplay DVDs are made from two pieces of plastic – one or both of which have a reflective coating – that are glued together. Information on the DVD – a digitally-encoded movie, for example – is transferred onto the reflective surface, where it can be ready by a laser beam focused on that reflective surface. The reflected laser beam is read by the DVD’s optical sensor. Precise focus and clear transmission of the laser beam is required for playback of the DVD. Flexplay DVDs use a proprietary, patented adhesive to glue the plastic disc halves together. Removing the Flexplay DVD from its sealed package exposes the disc to oxygen, triggering a gentle, controlled chemical reaction with the special Flexplay adhesive. After 48 hours – but not sooner – the adhesive begins to interfere with the DVD laser beam’s ability to read the disc. This all happens inside the disc, with no exposed chemicals or coatings. By the way, Flexplay DVDs are designed to ensure “perfect playback” during the entire 2-day viewing period. You won’t have to worry about the picture and sound fading out just as you get to the best part of the movie! And because they are “real” DVDs, Flexplay DVDs work in all DVD players, DVD drives and gaming systems designed to accept a standard DVD. The quality of a Flexplay DVD is indistinguishable from a standard DVD, offering the same great sound and picture quality. Interesting. I should have read the back. It's Digital Video Express 2.0! 10 years later and they haven't learned their folly. Also, this is not a green product in the slightest. Tons of disposable waste. If it's FlexPLay, as posted above by angrygoatee, the website mentions recycling it. In any case, I'll stick with the online stuff. I saw the "recyclable" bit after I ranted, but are people really going to recycle them? The similarity to DIVX is eerie and that they survived that implosion in 1999 and then were able to buy out a competitor just boggles my mind. True. I believe people would just throw it away and not bother recycling them. Yeah. Welcome to the wasteful world of no-returns. I can't wait for digital delivery to ramp up. Cool idea... but I still would rather have digital.